Creative professionals such as graphic designers, fashion designs, entrepreneurs, and artists of all sorts, are part of a professional demographic that simply speaks a different language than others. So when it comes to the numerous motivational books on the market, many fail to make a meaningful connection with career creatives. 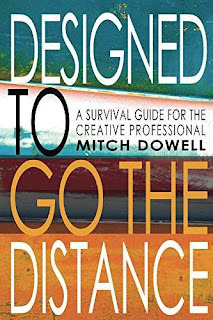 "Designed to Go The Distance" touches upon many career and lifestyle issues specific to those in creative career fields – cultural topics that are not often talked about or adequately prepared for. It's a quick, yet meaningful mid-career pep-talk for career professionals. The perfect addition to the creative professional’s bookshelf, or even for non-creatives who need to understand the mentality and culture more in-depth, Designed to Go The Distance is sure to be an engaging and informative read.